They say that in order to achieve peak performance, you’re going to have let stress into your life. This may be true, but those high-performing people should know that they’re going to pay a price from their health to get there. Our service, coupled with an exceptional level of dental care provided by Dr Jones and his team of highly qualified hygienists, makes our practice an excellent choice for your dental care. 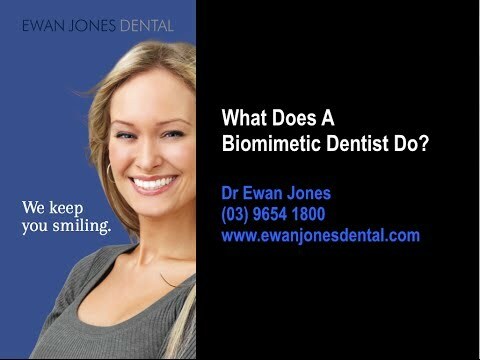 Dr Ewan Jones practises Biomimetic Dentistry, a cutting-edge technique which preserves your natural teeth for the long-term and which is minimally invasive. Ewan is skilled in all areas of dentistry, including cosmetic smile makeovers, minimally invasive restorative dentistry and dental implants. He is renowned for his skill at recreating and restoring teeth to appear natural by mimicking nature, using Biomimetic techniques. Our service coupled with the truly exceptional level of dental care provided by Dr Jones and his team of highly qualified hygienists makes our practice an excellent choice for your dental care. Dr Jones has a calm, gentle and compassionate manner. He believes in taking things at your pace. At Ewan Jones Dental we stay up to date with the latest in dental technology and continuing education so we can offer you the very best in cutting edge dental care. We are committed to practising minimally invasive biomimetic dentistry which aims to keep as much of your natural tooth structure for the long-term. We offer an extensive range of services including cosmetic dentistry. Contact us now to make an appointment. Calm and soothing, our reception is filled with aroma for tranquility. Digital screens and DVDs in each room. Your dental health is of utmost importance to us. Our team of highly qualified hygienists have over 60 years of experience between them. Wendy, Cathy and Denise are on hand to provide you with a personal oral hygiene plan so you can look after your teeth and gums between visits. Priya completed her Bachelor of Dental Surgery at The University of Adelaide in 2007. A member of the Australian Dental Association, Priya has a special interest in family, cosmetic and preventative dentistry. Outside of dentistry Priya enjoys being a mother, travelling and playing piano. Milly graduated from the university of Newcastle in 2008 with a Bachelor of Oral Health. Since graduating Milly has gained a breadth of experience working in both rural and Metropolitan areas. Milly has extensive experience working with vulnerable members of the community and has a passion for working with phobic patients and patients with special needs. She has worked as a clinical demonstrator for the RMIT dental hygiene training program. Since graduating Milly has worked in cosmetic and family dental practices. She is a contributor to the Dental Hygiene Association quarterly publication. Since graduating as a dental hygienist in 1992, Catherine has worked in several leading private practices in Adelaide and Melbourne. Catherine joined the team at Ewan Jones Dental in 2004, and is well respected for her excellence in her technical abilities coupled with her gentle, compassionate manner. Catherine has a keen interest in the innovations of dental hygiene and continues her education in this field by attending regular professional development courses. Lucy has extensive experience in many dental fields over the past 16 years, working in both Victoria and Tasmania. Her extensive knowledge of cosmetic and general dental procedures allows her to answer any questions you may have. Courtney has been a valued member of our team for the past 2 years and has experience in all areas of our practice. Courtney has a calm and soothing chairside mannner and is always very happy to answer any questions or concerns about your upcoming treatment. 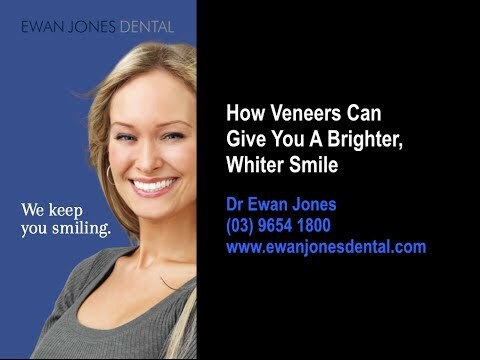 At Ewan Jones Dental we pride ourselves on the quality of our Dental Treatment. Dr Jones practises the latest in Biomimetic Technology. By doing this we can preserve the natural tooth structure restoring the tooth to as close to its natural condition as possible. By using only the highest quality dental materials and Australian based Dental Laboratories we never compromise on the quality of our work. Veneers are used to reshape, rebuild and strengthen crooked, chipped or broken front teeth. If your teeth only have small chips or do not need significant shape change, the most appropriate veneer to use is one made of composite material. The composite is tooth-coloured, and is sculpted over the surface of the tooth to create the new shape. Where significant shape change is necessary, porcelain veneers are the preferred choice. First of all, we shape the surface of the tooth, then take a mould which is sent to our master ceramists. Hand tinted porcelain veneers are then custom-made so that they match the surrounding teeth perfectly. If you are considering having your teeth whitened, it’s best to have this done before having veneers fitted, to ensure a uniform colour. Oral hygiene is essential if you want to keep your natural teeth for the long term. Our dental hygienists can advise you on how to care for your teeth. Visiting your Dentist and Hygienist for regular treatment is an essential part of maintaining your natural smile for life. However, what you do between visits is also critical to maintaining optimal oral health. Our experienced Hygienists will provide you with a personal oral hygiene plan to assist you in maintaining your oral health between visits. When it comes to first impressions, your smile can be a tremendous asset or your greatest liability. Your smile can be quickly and easily enhanced by using our home teeth whitening system. A mild whitening gel is placed in a custom tray that is worn over your teeth in the comfort of your own home. You choose the time, either during the day or in the evening. Under our supervision, this whitening program has proven to be safe and effective. Together we control the ultimate outcome – whether you want dazzling white teeth or merely a brighter, fresher smile. A beautiful smile is just a phone call away. If you’re unhappy with your gummy smile, a simple ‘gum lift’ may be the answer. Your smile may be enhanced by simply recontouring the shape and height of your gums to show more tooth. Tooth coloured fillings are the best way to go. We use bonded composite rather than silver amalgam fillings. The composite material is matched to your existing tooth colour to keep your tooth looking natural. No more unsightly old black or silver fillings. For larger areas we recommend porcelain inlays to add strength and return teeth to their natural appearance. Crowns are used to protect, strengthen and rebuild broken or weakened teeth. We use porcelain alone or in combination with zirconium or gold. We will discuss the best choice for your individual needs at your consultation. Following preparation of your tooth a mould is sent to our master ceramist. Hand tinted porcelain is colour matched to your surrounding teeth. Our ceramist uses only the finest porcelain to produce natural looking teeth. A bridge is used to replace single or multiple missing teeth. A crown is placed on the teeth on either side of the gap, forming a ‘bridge’. As with crowns, we either use porcelain on its own or combine it with zirconium or gold. A mould of the prepared teeth is sent to our master ceramist, who will hand tint the porcelain to match the colour and shape of your surrounding teeth, using only the finest porcelain. When having a crown or bridge done, many patients take the opportunity to whiten their surrounding teeth. The new teeth are matched to the whiter, brighter colour, producing a beautiful result. For your comfort and safety we remove existing amalgam restorations isolated with rubberdam. The amalgam is removed in large pieces and any vapors are quickly removed with high volume suction. We then repair the tooth using state of the art Biomimetic restorations. Check out some of the work we have completed on our happy patients. Please fill in your details below to allow us to respond to your enquiry promptly. Please note that some providers may be booked 1-2 months in advance. If you are requiring emergency dental care, please call our office on 9654 1800 for an immediate response. Your main area of interest?